You are here: Home › In Love We Pray. 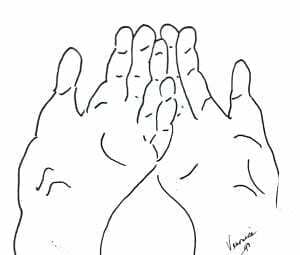 . . amen and amen. . . .
As dawn breaks, my fingers of both hands curled about each other and I marveled at their slimness, their ability to elicit the feel of themselves, each digit wrapped around the other. And I felt that nothing, no other world would ever make me feel such blessedness in my hands’ ability to do so many things over the course of a life. To kneading bread, to winding the yarn, to smoothing the brow of my very sick child and have him telling me later that it helps him sleep. Everything I touch holds a lesson for me. The square inch of soil I spooned with young hands yielded secrets kept from generations. The eyes of a child as my hands embraced young shoulders tells me what went into their ancient heritage. And I grasp their hands in mine and convey my love by touch. how very much I can love on this planet called Earth. whose futures we have already mortgaged. that the sun needs our greeting and night wishes it bid good. what has so faithfully harbored us. In love we pray, amen and amen. 2 Responses to In Love We Pray. . . amen and amen. . . .
Claudia, from my heart it is. I am glad you found it to be so. Thank you.